As an athlete Seth Friesen knows a lot about balance. Driven to excel in the classroom and on the volleyball court, Friesen found a place where he didn’t have to sacrifice his goals in either area when he chose to attend Brandon University. A top-notch student and volleyball player in high school, Friesen had plenty of options to choose from when it came time to select a university, but the Brandonite found the perfect blend of academics and athletics right here at home. “The volleyball program is strong here and allowed me to stay close to compete at a high level,” Friesen says. 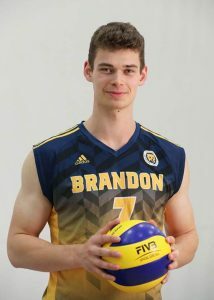 A towering six-foot-eight presence at the left-side position, Friesen has emerged as one of the top players in the Canada West Universities Athletic Conference and has helped the Brandon University Bobcats find a place among the elite teams in Canada. Despite the time and commitment required to compete at a high level, he has also maintained excellent grades as he works toward his Bachelor of Science degree with an eye toward pursuing medicine after he graduates from BU. Friesen credits his education at Vincent Massey High School, where Advanced Placement science and English classes helped him to develop time management and study techniques that he relies on at BU. Friesen’s hard work has been rewarded, not only in terms of his success as an athlete and a student, but also in the form of scholarships that have helped him to keep his focus on his goals rather than worry about his finances.